#AmericanWindWeek coincided with a historic announcement this week that Apple, Akamai, Etsy and Swiss Re are partnering together to purchase 290 MW from planned wind and solar projects in Illinois and Virginia, respectively. Aggregating demand can help smaller demand customers access renewable energy projects with economies of scale. Just last week, Smuckers announced a 60 MW PPA with a planned Nebraska wind project; the following day, Facebook announced its most recent 139 MW PPA with the Headwaters II Wind Farm in Randolph County, Indiana. Read more here. 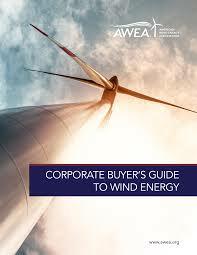 AWEA’s newest primer introduces new corporate customers to the world of wind energy procurement. The primer explains the multiple ways that a buyer can purchase wind energy. For those interested in learning more about PPAs, it also provides detail on the common terms found in a PPA, the typical negotiation points that can be expected, and the ways in which buyers and sellers can allocate risks inherent to the negotiation points. This entry was posted in NewsBlog and tagged American Wind Energy Association (AWEA), American Wind Week, CleanTechnica, Corporate Buyers' Guide to Wind Energy, Into the Wind - AWEA Blog on August 10, 2018 by Helen Deffenbacher. 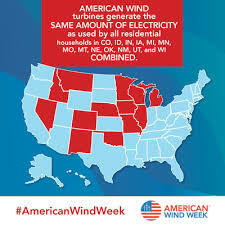 We’re halfway through the second annual #AmericanWindWeek! In more than 30 towns and cities across the country, communities and business leaders have gathered to celebrate a future powered by thin air. 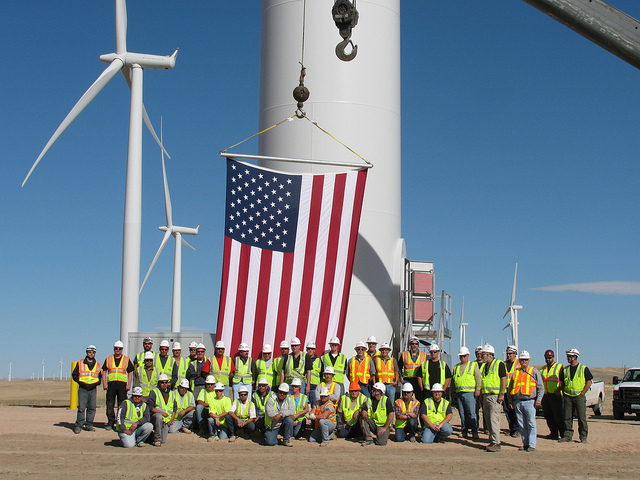 From North Dakota to Florida, and Oregon through New Jersey, Americans are celebrating the economic opportunities, job creation, energy independence and clean air created by wind power. The conversation has boomed on social media too. 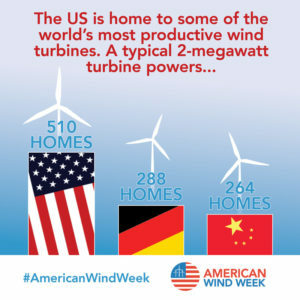 Here are some favorites from the first half of #AmericanWindWeek. Make sure to join the conversation! Continue reading here. 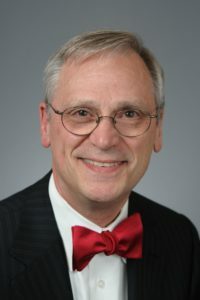 “Wind energy powers homes, reduces carbon pollution, and creates jobs in rural communities—and the Pacific Northwest is leading the way,” said Rep. Blumenauer. “Now more than ever, we should be expanding access to clean energy sources that are affordable, efficient, and aid in our efforts to combat climate disruption. Our fight continues in Congress.” Read the entire news release here. This entry was posted in NewsBlog and tagged American Wind Week, Representative Blumenauer, U.S. Wind Champion Award on August 9, 2018 by Helen Deffenbacher. In the past year, Iowa and South Dakota produced more than 30 percent of their electricity from wind, and 12 other states exceeded 10 percent (Kansas, Oklahoma, North Dakota, Minnesota, Colorado, Vermont, Idaho, Maine, Texas, Oregon, New Mexico, Nebraska). Tri Global Energy to develop a 100MW wind farm in Nebraska, reNEWS This will be the company’s first such project outside of Texas. Development of the Sugar Loaf wind farm will be initiated this year, a spokeswoman told reNEWS. Sugar Loaf will bring the company’s wind portfolio to more than 2.9GW. Archived Article: What are wind techs, why are they so much in demand, and how do you become one? Free Online Course: Wind Energy – From Wind Turbines to Grid Integration. Available at Alison, online provider of free courses and workplace skills training. 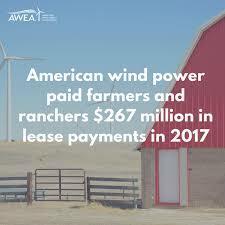 This entry was posted in Nebraska / Midwest News, NewsBlog and tagged American Wind Energy Association, American Wind Week, Department of Energy Report, renewable energy, Sugar Loaf Wind Farm, Target stores, Tri Global Energy, wind energy growth in 2016, wind techs on August 9, 2017 by Helen Deffenbacher.